Mid-August and the commuting is easy. Fewer cars, buses and motorini, as well as fewer people and closed shops define the period from now through the end of next week. Starting the 25th, life will return to the city. For now, we enjoy the quiet. 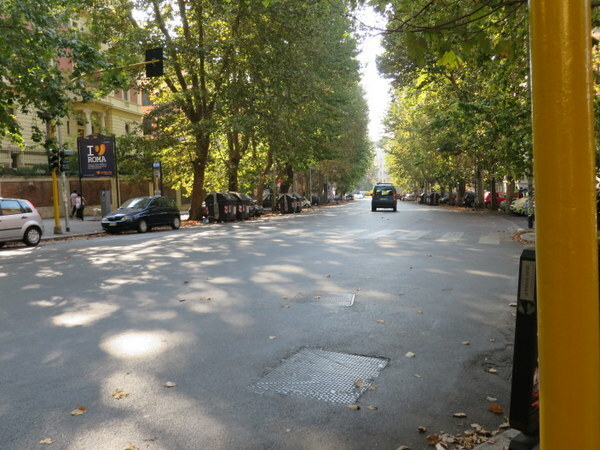 Usually the major avenue near us, Viale Parioli, is chock-a-block with vehicles. Ric says on a normal evening you could practically walk across the street on the tops of cars. This is Viale Parioli at 17:30 this evening, the major shopping street a few minutes walk from our apartment. Usually it is a hubbub of cars, motorcycles, buses and people scurrying to do their shopping. Sunday morning it was so quiet we could hear the priest in the church across the street giving his homily to a greatly reduced congregation. His voice echoed off the walls and spilled into the street. No matter how long we live here, I think we will find this an interesting and amusing cultural phenomenon: everyone who can leaves town and goes to the beach for as much of August as they can manage. Many shops and restaurants close from the 1st to the 31st, some for only a couple of weeks. Friday is the holiday, Ferragosto, which has its roots in ancient Rome introduced by Emperor Augustus. Families will lunch, everything that can manage to will close, and we will get the day off. Gotta love the foreign holidays! To my Italian friends, buona festa. Typical sign on a local restaurant. Nice break for the employees, paid of course! Sounds delightful. Hope you had everything you needed before it started!! We actually planned a grocery delivery before they shut down THAT service for the week! I love your descriptions of how things are because I truly can picture it, see the streets, and even the full beaches! Thank you Marcia! you are lucky I don;t describe the un-airconditioned buses and trains. 🙂 They are not all that way… but enough are that one has to decide if riding is worth the sweating. I love the large European cities in August. More room for me. Used to live on Via Panama, so like your posts about Parioli. Ah, a “local.” It’s better every day…until the 25th when they all start to come back. I am happy to say I finally subscribed to your blog – looking forward to the updates! Welcome Maron! 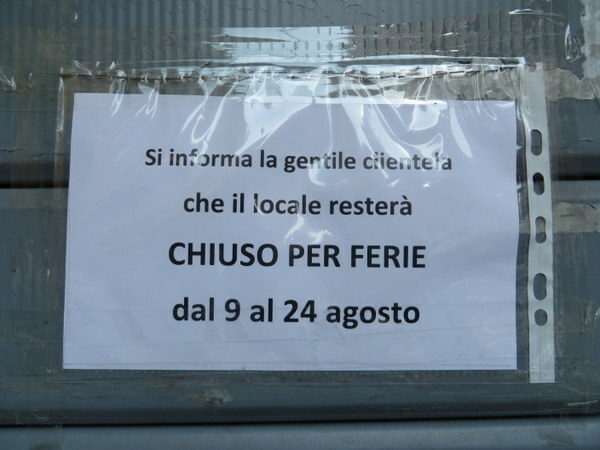 There are two types of people: t\Those who are NEVER in Rome in mid-August, and those who relish the time the others are away. We are planning to go to Paris for our 30th anniversary in March! I may have to ask you for some advice.